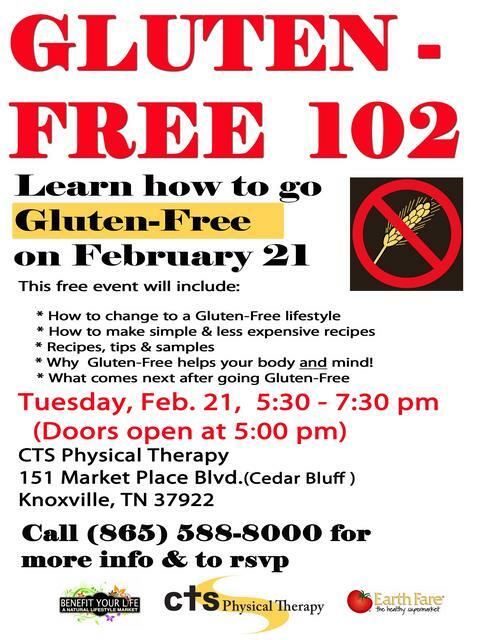 Following up on Gluten-Free 101, its first Gluten-Free education event, CTS Physical Therapy recently welcomed a large crowd for “Gluten-Free 102”. More than 50 people crammed into the Knoxville office to learn more about the first steps – and reasons why – to go Gluten-Free. Ulmer talked at length about recent research concerning the underlying medical complexities of gluten sensitivity and other reasons to eliminate gluten – and sugar – from one’s diet. In addition, two patients offered testimonials about the program, gluten-free recipes were discussed and local health food markets Benefit Your Life and Earth Fare offered numerous samples to participants. Indeed, with more and more research echoing that sentiment, the increased publicity for Gluten-Free living and a dramatic increase in the number of gluten-free products available in even large grocery store chains lead to the inescapable conclusion that the gluten-free phenomenon is here to stay. Pleased with the turnout and the reception from participants, Ulmer – whose own family has been gluten-free for a decade – plans to offer other seminars in the future to handle other complex questions, situations and topics.